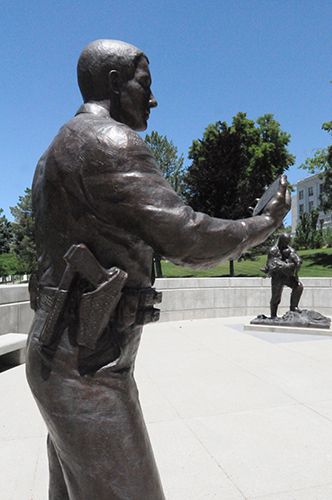 This memorial to Utah’s law enforcement, dedicated on September 6, 2008, replaced a smaller one previously displayed inside the Capitol prior to the preservation project. This new memorial was sculpted by Utah artist Lena Toritch and depicts three individual scenes in bronze. The stone wall behind the sculptures displays the names of 137 officers that have died while protecting Utah citizens. A round plaque serves as the centerpiece of the monument and is laid in the ground to honor those who served our great state. The words—”all give some, some give all”—remind visitors of the sacrifice made by Utahns all over the state.